From 14th September 1883 to 10th November 1938, there was a synagogue run by the Jewish community on the edge of the town center of Essen-Steele. This synagogue has been visited regularly by the Jews residing in Steele before the Nazis increased the persecution of Jews. 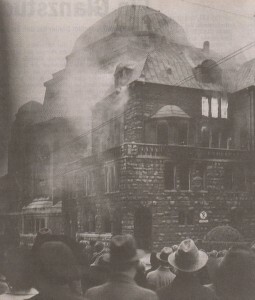 This disturbing picture of the synagogue burning dates from the collection of Horst Zimmer, who kindly supported our project. Probably the most worrying fact about this photograph are the commen citizins of Steele watching the scene. In addition, a relief set in the wall of a building drops a hint concerning the past of this location. The racist policies of the Nazis affected the Jewish part of the population in a brutal way. 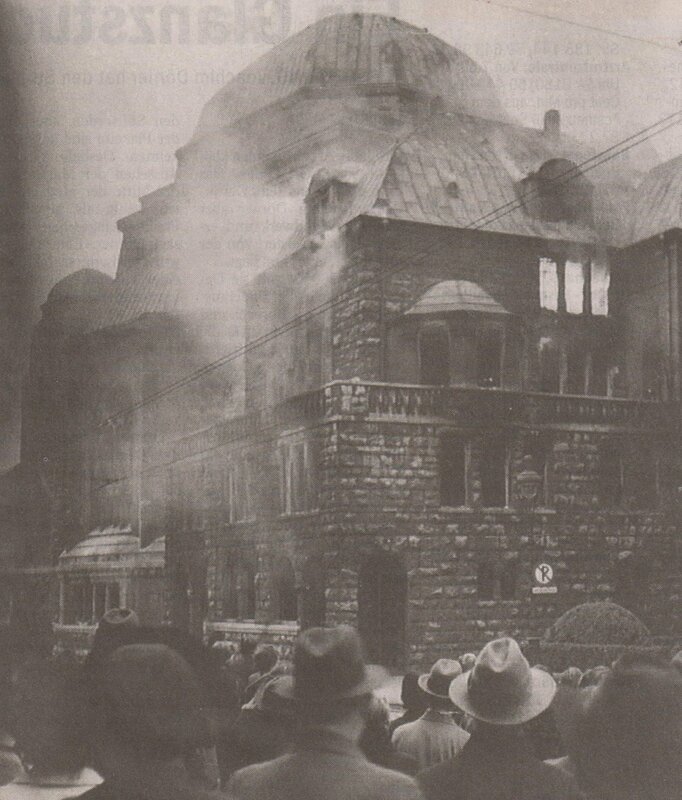 During the so-called Reichspogromnacht on 9th November 1938, the fascists shattered and burned synagogues as well as shops owned by Jews. Nazi thugs also killed Jewish people or drove them to commit suicide. Unfortunately, the limit of inhumanity was not yet reached. During World War II, especially from 1941 onward, the Nazis carried out an outrageous genocide in whose course 6,3 million Jews were put to death. With reference to the situation in Steele, one must mention the fate of the Isaacks (Siegfried, Ruth, Margarete and Bruno), who once lived in the town center of this part of Essen. They were deported by the Nazis in 1942. The stumbling blocks on the southern edge of the town center witness even today the misfortune which happened to this family. All family members mentioned above perished in the concentration camp of Izbica. 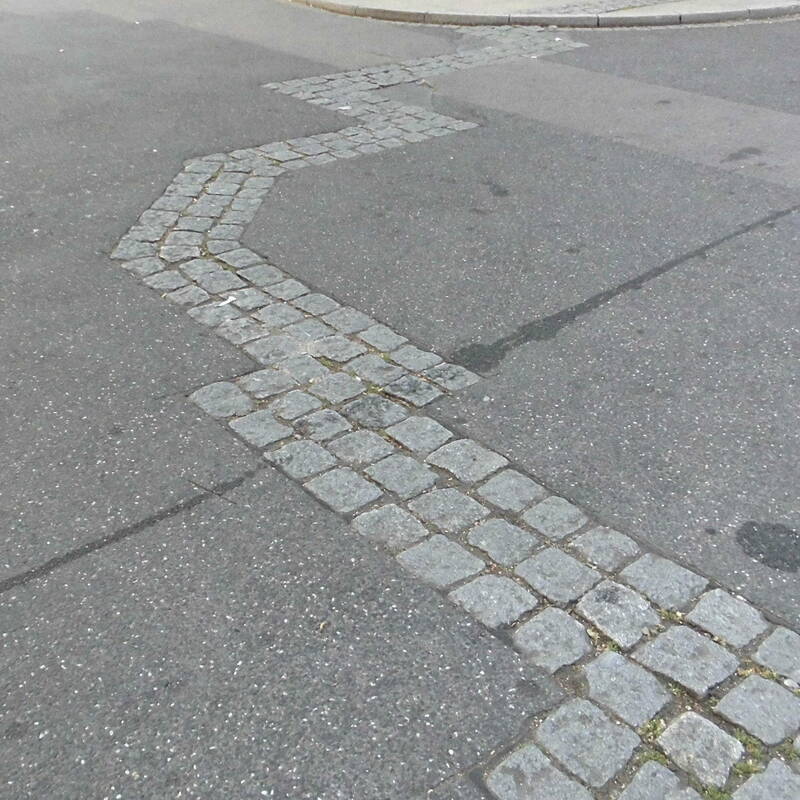 In our days, the former contours of the synagogue are set in the ground, reminding attentive pedestrians of the dark secret this place still hides. Even before the aforementioned Reichspogromnacht, right after they took over, the Nazis treated Jews like second-class citizins, implementing in addition to that discriminating laws (Nürnberger Rassegesetze, 1935), underpinned by a racist court ruling. In conjunction with a daily propaganda machinery booming most of the time, the foundations for the genocide to come were early laid. By means of launching the stumblestone project, Gunter Demnig – an artist from Cologne – tries to restore the victim’s names while creating a completely new method of making people aware of what happenend during the Nazi period. In each case, the stones are set into the ground in front of the last building the current deported person chose voluntarily as a home. The project wishes to push deportation stories to the fore in order to remember the persons perished by the Nazi regime. Following this link, you can get an insight into the Nazi past of Steele, translating the given newspaper titles and regarding the corrensponding pictures. Demnig focusses on questioning and therefore criticizing the common view affirming that „the“ Germans just didn’t know about the abominations taking place in their neighbourhood between 1933 and 1945. 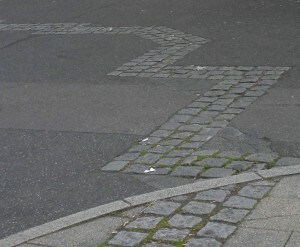 Due to the considerable Jewish community in Essen before Hitler’s rise to power, you can still find many stumbling blocks in several districts of our city. 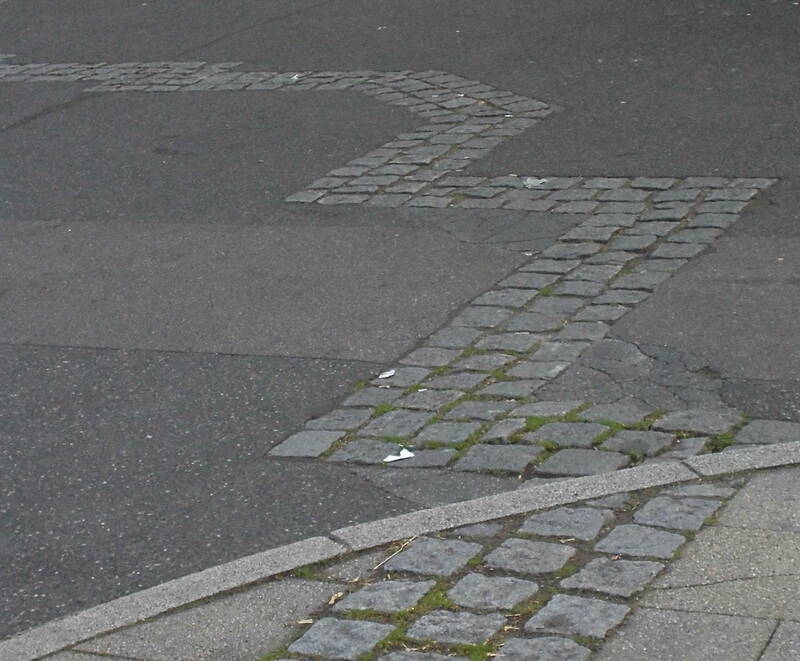 1) Take a photograph of the contours you can see on the ground or – that’s up to you – of the relief set in the building. Formulate a brief text concerning your trip to the former synagogue. If you want, you can offer your text to us for that we upload it within the framework of this website. 2) Imagine you could travel back in time, finding yourself again in 1932. With a whole lot of scepticism you watch the Nazi movement mount more and more. Draft a short conversation between you and a Jewish friend. What exactly do you suggest this friend to do? Shall he or she deal with the threats established by the Nazis? Shall he or she instead flee and seek safety in another country?